We’re so excited about our mention in the January 2014 issue of SELF Magazine, with mega-fitness guru Jillian Michaels on the cover! 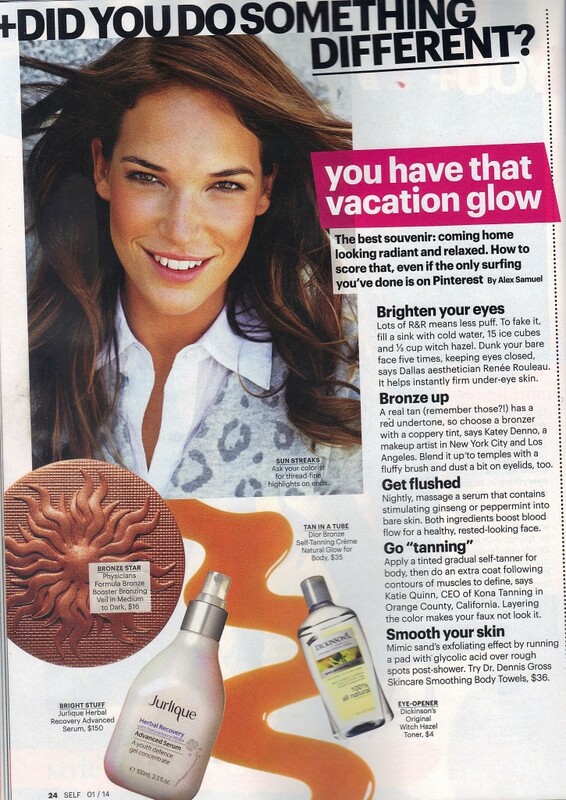 Kona Tanning CEO Katie Quinn was interviewed on achieving a vacation glow after the holidays, and the simple way to “contour” muscles using an at-home tanning lotion (like the Kona Tanning Gradual Tanner). For a limited time, get your own perfect glow from home using the Kona Tanning Gradual Tanner – coupon code ‘SELFMAGAZINE’ gets you a free 1-ounce Tanning Spritzer with any purchase ($18 value)! Try mixing the Spritzer into your Gradual Tanner, to customize your own color. Questions? Ask us on our Facebook Page!